Producers Whoopi Goldberg and Stage Entertainment present the new Broadway musical SISTER ACT, which began preview performances on March 24, 2011 and officially opened on Wednesday, April 20, 2011 at the Broadway Theater. SISTER ACT received five 2011 Tony Award nominations: Best Musical, Best Original Score (Alan Menken (music)/ Glenn Slater (lyrics)), Best Book of a Musical (Cheri and Bill Steinkellner and Douglas Carter Beane), Best Actress in a Musical (Patina Miller) and Best Featured Actress in a Musical (Victoria Clark). The Broadway company of SISTER ACT features Tony Award and Olivier Award-nominee Patina Miller as Deloris Van Cartier, Tony Award-winner Victoria Clark as Mother Superior, Fred Applegate as Monsignor, Sarah Bolt as Sister Mary Patrick, John Treacy Egan as Joey, Demond Green as TJ, Chester Gregory as Eddie, Kingsley Leggs as Curtis, Marla Mindelle as Sister Mary Robert, Audrie Neenan as Sister Mary Lazarus and Caesar Samayoa as Pablo. The ensemble of SISTER ACT includes: Jennifer Allen, Natalie Bradshaw, Charl Brown, Christina DeCicco, Holly Davis, Madeleine Doherty, Alan H. Green, Blake Hammond, Wendy James, Carrie A. Johnson, Kevin Ligon, Louise Madison, Marissa Perry, Ernie Pruneda, Corbin Reid, Lance Roberts, Rashidra Scott, Jennifer Simard, Lael Van Keuren, Roberta B. Wall and Alena Watters. When disco diva Deloris Van Cartier witnesses a murder, she is put in protective custody in the one place cops are sure she won't be found - a convent! Disguised as a nun, she finds herself at odds with both the rigid lifestyle and an uptight Mother Superior. Using her fabulous disco-ness and killer voice to inspire the choir, Deloris breathes new life into the church, but in doing so blows her cover. Soon it’s nun-on-the-run time, but she finds salvation in the heavenly power of her newly found sisterhood. Based on the mega-hit feature film, SISTER ACT features an original Alan Menken/Glenn Slater score with a vast inspiration of musical styles from Motown, soul and funk to great big disco anthems and Barry White inspired musical comedy. This is a feel good show, and the cast featuring the uber-talented Patina Miller, brings down the rafters. You'll laugh, you'll cringe, you'll feel for Deloris, and most of all, there's a real tenderness in her relationship with the sisters who go to lengths to protect and stand up for her. I've long been a fan of Alan Menken, and Glenn Slater, and the title song Sister Act in Act II was packed with emotion and depth. It's a beauty that you'll remember long after the show. SISTER ACT features scenery by Klara Zieglerova, costumes by Lez Brotherston, lighting by Natasha Katz, and sound by John Shivers. The music department includes Musical Supervisor Michael Kosarin, Music Director Brent-Alan Huffman, and orchestrations by Doug Besterman. DISCOUNT OFFER -- TO SAVE, USE CODE SANXT719. Tuesday at 7pm, Wednesday - Saturday at 8pm, Wednesday and Saturday at 2pm, and Sunday at 3pm. Tickets, ranging in price from $51.50 - $129.50, can be purchased via http://www.telecharge.com/ or by calling 212-239-6200. 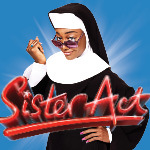 For more information, visit http://www.sisteractthemusical/.